A ripe peach should have a sweet fragrance. Select peaches that are golden yellow to yellow in color and avoid peaches that have any green on them. A red blush on the skin is not an indication of ripeness but rather of variety. Ripe peaches should be soft but not mushy. Peaches bruise easily so do not squeeze them with your fingertips. A ripe peach should have a well defined cleft or crease in the shape. Store peaches at room temperature until they are ripe and then store them in the crisper drawer of the refrigerator up to 5 days. Wash, peel, half and pit the peaches then cut them into slices. Lay the peach slices in a single layer on a baking sheet and put the baking sheet in the freezer until the slices are frozen. Once the peaches are frozen place them in a freezer container or freezer bag and store them in the freezer. 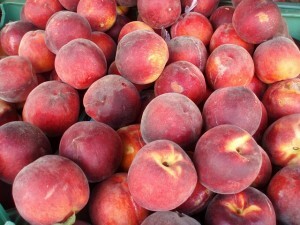 Most peaches will continue to ripen after they have been picked, however, if they are too green, they will not ripen. To ripen peaches leave them spaced out on the counter, laying on the shoulders, or top. To speed this process leave them in a place they will receive direct sunlight but not too much heat. To ripen peaches faster place them in a brown paper bag with an apple or banana and fold the top closed. The ethylene gas of the fruit will speed the ripening process. Once the peaches are fully ripened store them in the refrigerator.